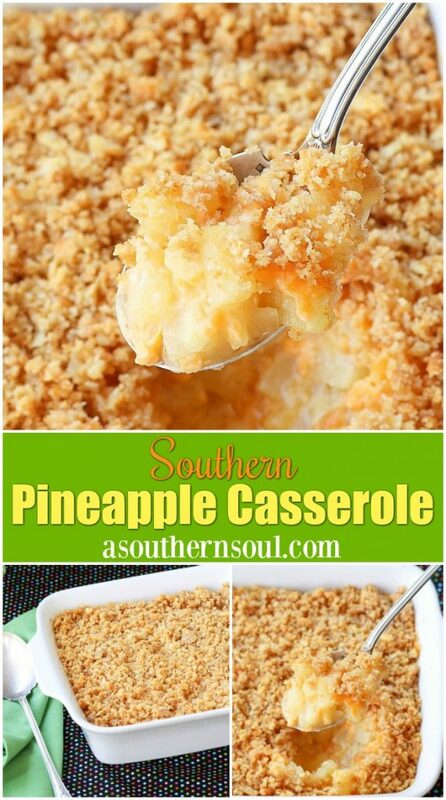 Pineapple Casserole has become a classic, southern dish and for good reason. 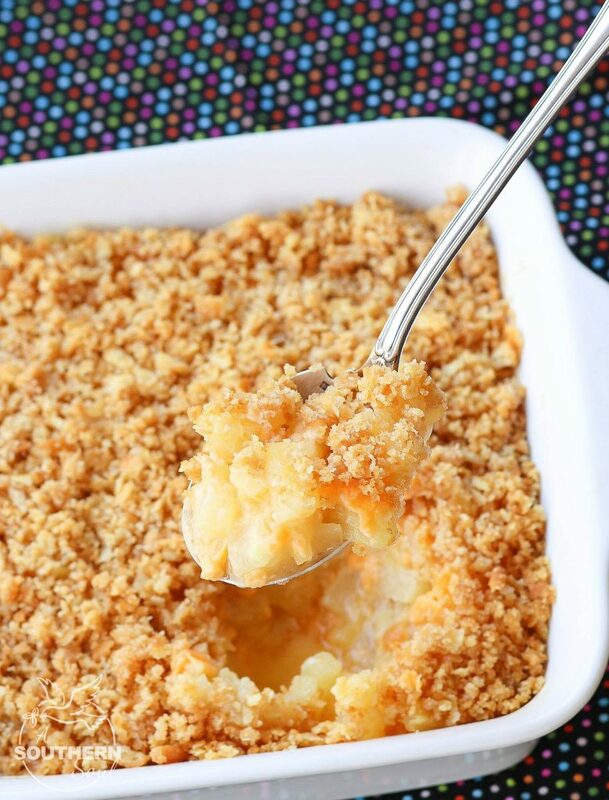 It’s sweet, savory and has a buttery topping that makes it totally addictive! 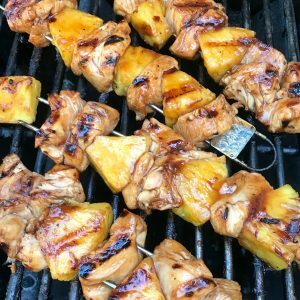 If you’ve never had Pineapple Casserole, you might be rolling your eyes at the thought of such a concoction. 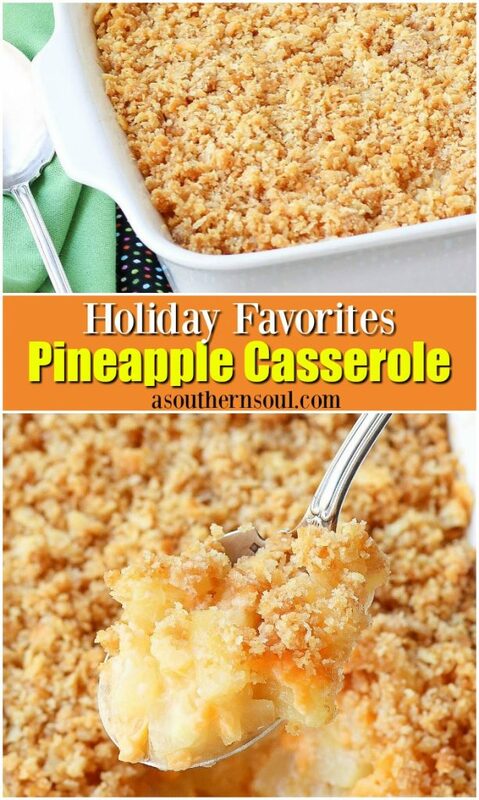 Actually, I wouldn’t blame you one bit since it does seem quite strange that someone would want to make a casserole from pineapple, right? You also might be thinking this is one of those “crazy southern dishes” that is just so hard to understand that you’d never want taste it, much less make it. That’s where I’ve got to stop you. After just one bite of this sweet, savory, buttery, crispy cracker topped dish, you are going to fall hard…and I mean hard in love. You see, when you make a dish like Pineapple Casserole, it’s all about what you serve it with. 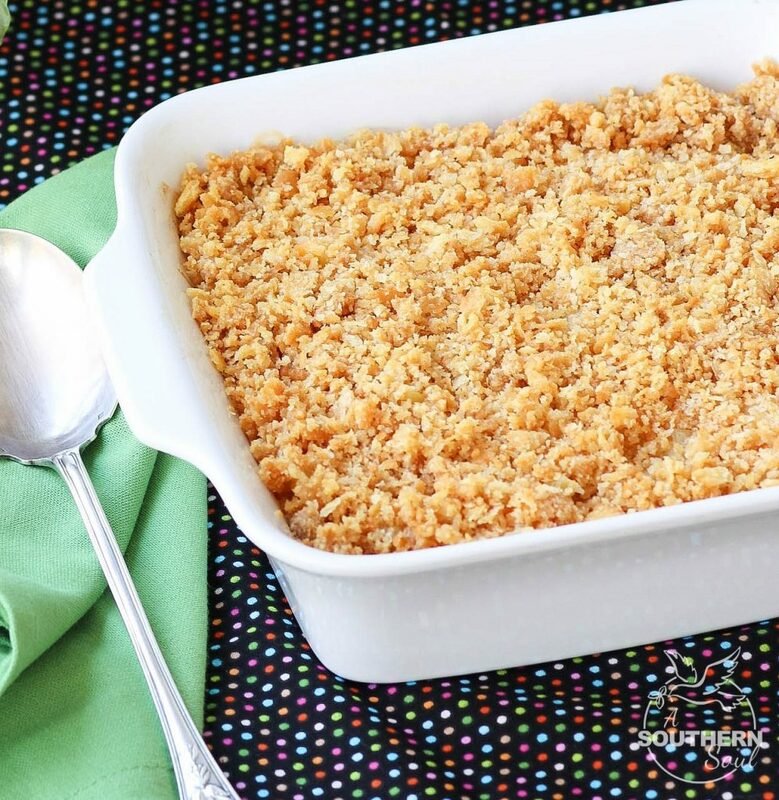 This recipe, which is so simple to make, is most often seen on tables during the holidays. 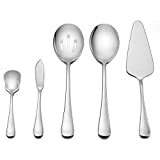 Which means, it’s an excellent side dish for turkey and especially for ham. There’s just something about a savory slice of ham nestled along side of a spoonful of pineapple casserole. 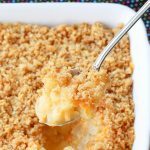 What’s in Southern Pineapple Casserole? 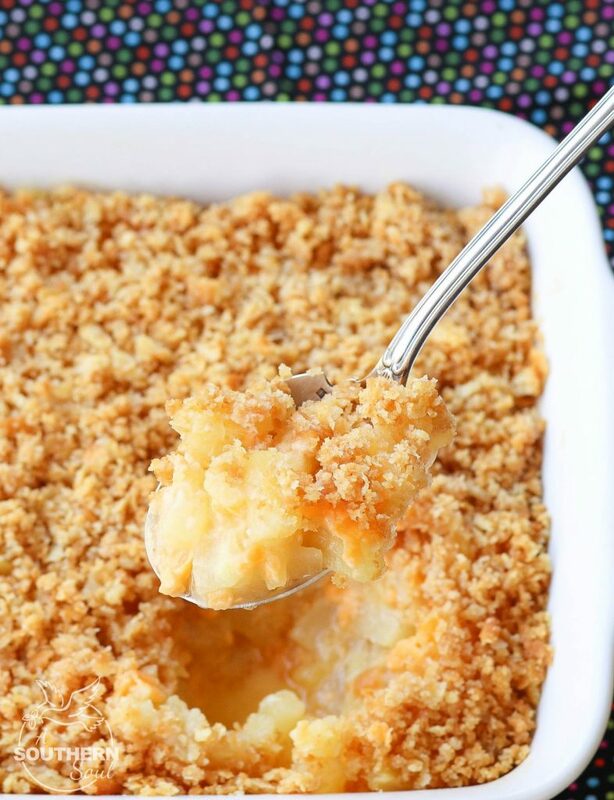 What makes this casserole such an unexpected delight is the addition of creamy, gooey cheese. I know, again, who’d think to bake pineapple and cheese together but trust me, it works! Of course, the crowning glory of this lovely undertaking is a layer of butter crackers. 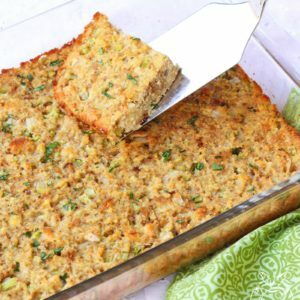 When it’s all baked together, you’ve got an extraordinarily delicious, somewhat uncommon dish that will become tradition in your home, I promise. And like me, you might find yourself making it for the holiday’s, Sunday supper or even for a weeknight meal. Heat oven to 350 degrees. 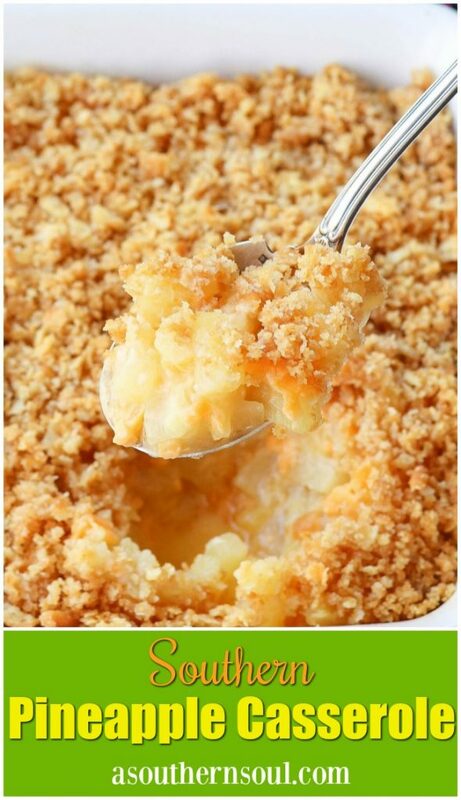 In a medium size bowl, combine pineapple, sugar, flour, cheese and reserved juice. 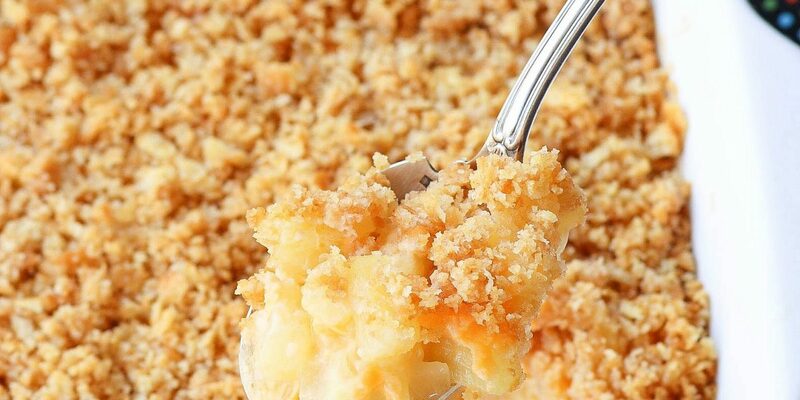 Mix together and pour into an 8x8 casserole dish. In a bowl, mix together crackers and butter. Sprinkle evenly over pineapple mixture. 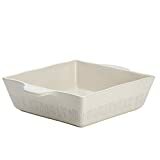 Place in oven and bake for 25 to 30 minutes until top of casserole is golden brown. Serve warm and enjoy! 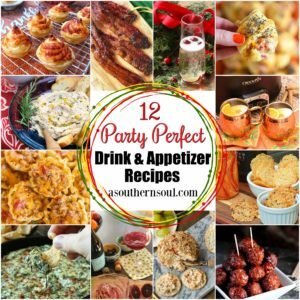 Pin this recipe HERE and FOLLOW A Southern Soul on Pinterest!